We reviewed principles of classical and operant conditioning in Chapter 5 (Conditioning). They developed out of the search for laws of learning by early comparative psychologists. Recall that early psychologists believed in continuity between animals and humans, in cognitive processes. All species were assumed to use the same processes in learning. Given such an assumption, it was reas­onable to compare different species such as cats, rats, monkeys, and humans to see how quickly they learned. If they all learned in the same way, then speed of learning should be the main difference between them. That turned out not to be true. Consider what happened to the equivalence of associations assumption. We briefly mentioned this in discussing the Garcia Effect in Chapter 5 (Conditioning). A psychologist named Garcia discov­ered that rats who were sickened by radiation, after drinking saccharin flavored water under red lighting, avoided the sweetened water afterward, but they did not avoid red light. The sickness was associated specifically with taste, not light. This was a surprise when Garcia dis­covered it. He had a hard time getting the finding published, because it seemed so strange. Psychologists were sure, at the time, that all stimuli were equally easy to associate. There was no reason for rats to ignore the color of light while paying attention to the taste of liquid. That was dramatically wrong. Garcia's discovery helped overturn the equiva­lence of associations assumption. In retrospect, it seems obvious why animals would have a bias toward blaming illness on food or water, not light. Illness is never caused by light. However, this is evolutionary thinking, and psychologists did not become comfortable with that until the 1970s. To early comparative psychologists, learning meant laws of association, such as reinforcement or trial-and-error. Those were general principles, so it was assumed they applied generally, to all acts of learning, regardless of content. Now we know: content matters. Species specialize in associating different sorts of things. Squirrels are great at memorizing the locations of acorns, but they are not extraordinary memorists when it comes to other materials. In general, animals excel at specific types of learning that helped their ancestors survive and reproduce. It seems obvious now, but this was not how behavioral psychologists thought from about 1870-1960, and it came as a surprise when they finally discovered it. The American researcher Edward L. Thorndike believed learning occurred through trial and error. The animal made many responses, many of them wrong or ineffective, and eventually learned to repeat those that got desirable results. Thorndike was a mechanist, like Loeb. He felt that no speculation about mind was necessary or useful. To Thorndike, trial and error learning seemed like a mechanical process for making associations between stimuli and responses. What was Thorndike's puzzle box experiment? How did he interpret it? To study trial and error learning, Thorndike used a type of test pioneered years earlier by Watson: the puzzle box. Originally, Watson's puzzle box (shown in the illustration) required a monkey to reach through the cage to lift a latch. Watson's puzzle box, which required a monkey to reach through the cage to lift a latch. Thorndike substituted a foot-pedal so the research could be done with cats. If the animal stepped on the switch, the door of the cage opened. Thorndike measured how quickly the cat performed this response. Today this would be called a study of escape learning. At first, cats put in the cage explored restlessly, meowed, but did not know how to escape. Eventually they stepped on the foot switch accidentally and the trap door opened. On succeeding trials, they operated the switch faster. What was Thorndike's Law of Effect? Thorndike explained learning with his Law of Effect. Animals tended to repeat a behavior that resulted in a "pleasing effect." This was an early version of the concept of positive reinforcement that B. F. Skinner used so effectively later in the century. Thorndike believed when an animal stumbled upon a behavior that produced a desirable effect. In accordance with then-prevailing S-R (stimulus-response) learning theories, psychologists thought the cat was creating a link or associative bond between a stimulus (in this case, being in the cage) and a response (stepping on the switch). Later, in the same stimulus situation, the response occurred faster. This showed a strengthened association between stimulus and response, due to the law of effect. 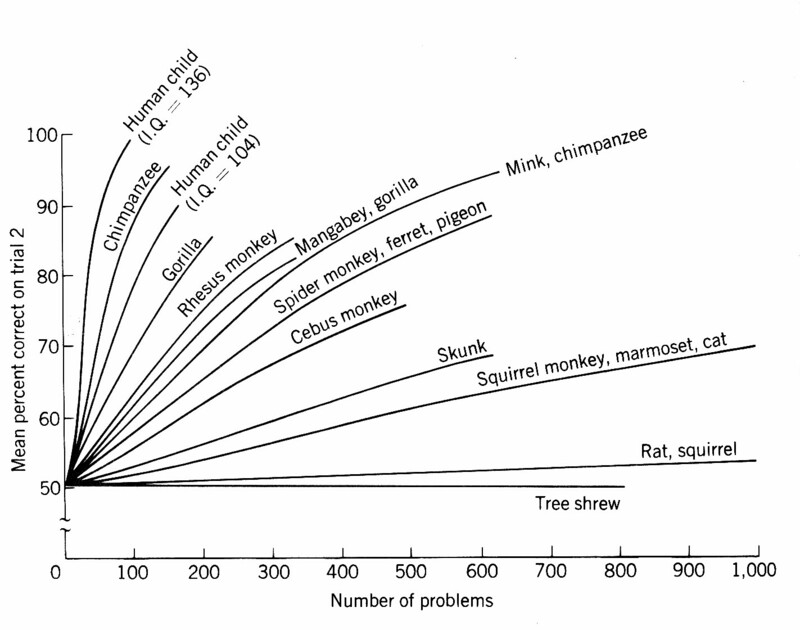 Thorndike compared the performance of fishes, chickens, cats, dogs, and monkeys in similar tasks. Not all these species could push a foot switch, so he altered the puzzle box as needed for each species, using a response the animal could perform. What did Thorndike find out about learning curves? Thorndike produced a graph called a learning curve showing the number of seconds the animal took to escape on each trial. The general shape of the learning curve was similar for each species. It resembles the acquisition curve for classical conditioning from Chapter 5 and the learning curve for human motor responses in Chapter 7. In each case, the curve resembles a gentle S shape. The animal does poorly at first, then catches on and improves its performance rapidly, until the performance reaches a maximum and levels off. In the case of the cats in Thorndike's puzzle box, each had difficulty escaping at first, but each eventually stumbled on the secret of opening the box. On succeeding trials the animal escaped faster and faster, with performance leveling off after the animal learned to escape as quickly as it could. Thorndike found that different species varied in how fast they learned and where their performances leveled off, but each produced an S-shaped learning curve. This seemed consistent with Romanes' idea that different species learned the same way, but at different speeds. Harry Harlow proposed a new method for measuring higher learning abilities of animals in 1949. Harlow suggested that humans and other highly intelligent animals not only mastered isolated tasks but also noticed patterns and shortcuts that made them more efficient learners. Learning to learn, which Harlow also called learning set, meant picking out a pattern from a series of learning experiences. Then a creature might learn even faster when faced with a similar learning situation in the future. What is "learning to learn"? An example in humans would be learning better study techniques in college. After learning how to do a particular type of learning in one class (lecture notes, research paper, web exercises, studying a book, group projects) you might be faster to do that same sort of learning in another class. How did Harlow study learning set in rhesus monkeys? Harlow did one learning set experiment in which rhesus monkeys had to decide which of two doors to open. If they selected the correct door, they found food. If they selected the other door, they found no food. The monkeys did not know (at first) there was a simple rule. Food was put behind the same door for six trials in a row. Each group of six trials was called a block. If the animal caught on to the pattern, then it should stop making errors on the second trial. Why? If it guessed wrong on the first try, it should switch to the other door then look behind it for the next five trials. On the other hand, if it guessed correctly on the first try, it should keep choosing that door. Why would a "smart animal" eventually make no errors on trial 2 in each block of 6? In accordance with the logic of the experiment, Harlow was interested in each animal's success rate on trial 2 in each set of six trials. At first, animals performed poorly on trial 2. They guessed randomly or per­sisted in whatever worked during the previous session. As the experiment went along, some of the animals caught on to the pattern. They started improving their odds of success on trial 2. Differences in how rapidly species "learn to learn"
A smart species like a rhesus monkey improved its success rate on trial #2 until it topped off at 100% (never failing to receive food on trial 2) after a few hundred trials. To less brilliant species, the pattern of the experiment was not so clear. Tree shrews never caught on. Some animals persisted with whatever worked on the last trial. If they found food behind door #1 during the last block, they might persist in looking behind the door #1 for all six trials of the second block, even though they were not getting any food as a result. Other animals adopted a random switching strategy, unable to pick up the pattern in the experiment. During the first two-thirds of the 20th Century, American psychologists did a remarkable number of experiments on rats. This was due to the assumption that all animals learned in similar ways. In that case, why not focus attention on species that were easy to raise and study in a laboratory? The albino Norway rat or Rattus norvegicus had many advantages as a laboratory animal. It was clean and easy to breed in captivity. The rat was easily tamed and easily handled, and it was a good learner. In many ways it was an ideal research animal for psychologists. Specialized breeding laboratories produced rats with a known genetic history. If researchers needed to study litter-mates (rats born from the same parents) laboratories could provide them. What are some advantages of the Norway rat, as a research animal? To show you how extreme this trend became, consider that Clark Hull presented his theory of motivation as a theory for all social sciences, not just psychology. It was based entirely on experiments with one species: the Norway rat. How did Hull's theory show an extreme development in the field of psychology? Frank Beach (1955) criticized the experimental psychologists of his day for focusing on such a small number of species and putting so much emphasis on the rat. 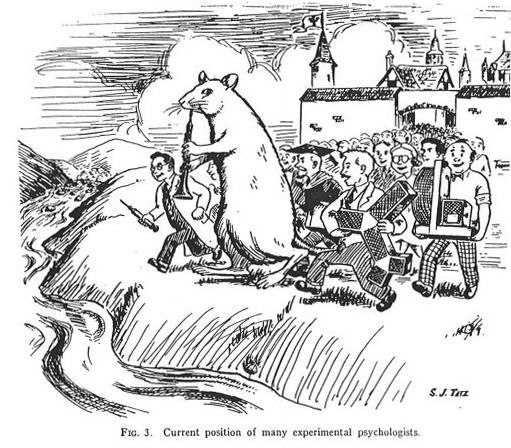 Beach's article in The American Psychologist included a cartoon showing a giant rat as a Pied Piper, leading experimental psychologists astray. A cartoon that appeared in 1950 in Frank Beach's American Psychologist article. What point did Beach make with a cartoon of the rat as Pied Piper? R. G. Cook (1993) did a survey and found that comparative psychologists in the early 1990s still mostly studied three groups: rats, pigeons, and college students. Monkey and ape research became less common due to a variety of factors including concerns over humane treatment of animals. In the meantime, however, comparative psychology underwent a transformation. It merged with its European cousin, ethol­ogy. We will discuss that in the next part of this chapter.